If you aren’t using Instagram as a musician already, there’s a new reason to get started on the popular photo-sharing social networking app. 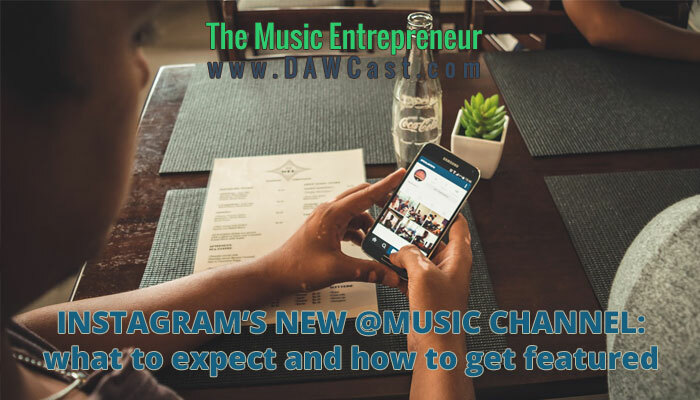 Digital Music News announced yesterday – April 30, 2015 – that Instagram just launched its own @music channel. …a new account dedicated to exploring music around the globe, from those who create it to the community around it. Each week, we’ll take a look at the musical experience on Instagram. That means showing you a different side of artists you know and love… and introducing you to up-and-coming trends from around the world… it means highlighting music photographers, album illustrators, instrument makers and, of course fans… we will also welcome community participation with a new, music-themed monthly hashtag project. Though there are only four photos on their stream as I write this, each one has already received anywhere from 2,600 to 16,000 likes! If you’re looking for exposure, this is starting to look like a great opportunity. Let’s take a look at what you can do to get featured as an artist. Although I cannot back up my thoughts with documented evidence, I can make some educated guesses as to what you can do to boost your chances of getting noticed by Instagram, so let’s get into it. I’m not going to lie; a lot of my tips are going to fall under the “duh” category, but I’ll get into them anyway, because common sense seems to be lost on a lot of people; especially those that are scrambling to jump on a new trend! More than likely, you’ll be able to increase your chances of being featured by Instagram if you take and share more photos using the app. First of all, Instagram will see that you’re an active user. Secondly, your odds of capturing some great moments are sure to increase if you are prolific with your photo-snapping efforts. Thirdly, you’ll likely drive more engagement on Instagram if you are regularly posting something new. If it’s going to be featured on an Instagram channel, it’s got to engage. Low quality, low value photos with no narrative potential are sure to be ignored. Of course, that’s the whole point of the app; it makes it easy for anyone to stylize their photos and make it look like they are better photographers than they actually are! Still, let’s be fair; if your photo has better quality, is connected to a fun or interesting story, and is on-point with Instagram’s objectives, it’s more likely to be featured. That brings me to my next point. Instagram has already laid out for you what kinds of things they’re going to be sharing: different sides of artists you know and love, musical trends from around the world, music photographers, album illustrators, instrument makers and fans. So, if you aren’t an established musical personality on Instagram already, your chances of being “artists you know and love” is pretty slim. And, unless you happen to be outside of North America, you probably aren’t “trends from around the world” either. I know, I’m sorry. But there’s still a way in; you can feature your favorite music photographers, album illustrators, instrument makers, and your fans. If you’re often playing out, snapping a few photos of your wild and crazy fans should be easy to do. Moreover, you can let them know what you’re doing to get more likes! If you want to play Instagram’s game, then make sure to play to it. This is certainly an optional tip, but if you’re still using an older smartphone (like I am), then it might be a good time to upgrade. Why? Because the newer phones allow you take better photos, plain and simple. Additionally, if you want to take photos with your fancy DSLR and send them over to your phone (i.e using Dropbox), you’ll have an easier time doing that if you have a faster phone. Of course, this largely depends on your budget, how badly you want to be featured by Instagram, and other personal, budgetary or technological considerations, but it serves to reason that a better quality photo has a better chance of getting noticed. A new smartphone will help with that. It’s nice to see a social network like Instagram actually acknowledge the importance of music to their platform (they’re owned by Facebook, remember?). Whether or not it will actually do anything meaningful for the music community at large remains to be seen, but overall I like what they’re trying to do. Also, we still don’t know with what kind of frequency they’ll be sharing photos on their music channel, but hopefully it increases. What do you think? Will you be working to get featured on Instagram? Do you think their music channel will help more artists become recognized? Let us know in the comments section below!